Fresh on the heels of listening to a whole discography worth of Death in June (don't ask), I happened upon the perfect antidote: The delightful sophomore LP that is Evil Invaders' Feed Me Violence. Original, thoughtful music, this is not. But it's fun as hell and guaranteed to bring a smile to even the most solemn face for approximately thirty-five minutes. The sound hasn't changed since Pulses of Pleasure. Mix an overdriven Judas Priest distortion with mid-80s thrash and you can practically see the glitter of the studs on the leather. Guitarist/lead vocalist Joe alternates between snarled lines and falsetto screams with an authentic enthusiasm worthy of his illustrious forebears of old, and the melodic hooks and soloing have both improved markedly. But despite the tropes of the 80s being still alive and well here, the band no longer has as cartoonish an atmosphere as the album that made me compare them to Gama Bomb. Calling speed metal serious would be a contradiction in terms, but the grandiose guitar instrumental solos at the beginnings of Oblivion and Shades of Solitude kicks any potential self-parody aside and stomps it under a steel-toed boot. But let's put the maunderings about the band's maturing songwriting ability aside, and stick to solid facts: The real attraction continues to be the violence of the band's two-guitar thrash attack. For the title track, the band gives us a headbanging-worthy blast of fury, but it's upstaged a few songs later by Anger Within, which has more interesting features in terms of riffing and in Joe's vocal delivery, not to mention a nice solid NWOBHM gallop on the choruses. Among the Depths of Sanity follows it with a beat that doubles the speed of its predecessor -- yet even at that speed, the machine refuses to break down and the track's delivery stays nice and tight. Evil Invaders might be excited about their music, but above all they are disciplined. 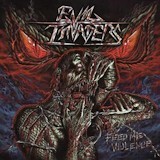 Feed Me Violence continues Evil Invaders' ascent, a measurable improvement over Pulses of Pleasure. Speed metal fans who are trying out some of the new releases will likely find this to be one of the best they've heard this year.